The architecture of Goa is a delightful combination of India, Mughal and Portugal styles. Since the Portuguese ruled this place for two centuries, many churches and houses bear a striking element of the Portugal style of architecture. Goa was also under the Mughal rule and thus one finds monuments built in the typical Mughal style complete with the domes. The typical Goan architecture is very simple and easy going and is visible in buildings like modern churches, houses, etc. 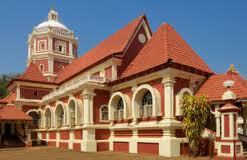 By the end of the 18th century, there was a sea change in style of buildings in Goa. Though the Portugal essence remained, there was an overdose of colors and usage of tiles increased. Blue and red turned out to be favorite colors with many houses being painted in bright blues and the roofs being covered by red tiles. The houses are usually large and have spacious rooms with windows for ventilation. Each house also has a separate room or secluded space for keeping the idol or photographs of their Gods thus indicating how religious the Goans are. Most of the houses have the bust of Jesus Christ at the entrance. Central staircases leading to verandahs and balconies upstairs are a unique feature of the architecture of Goa. The windows are usually curved inwards that are glazed with glass or oyster shells. A central courtyard is yet another feature of Goan architecture. The architecture of Goa is not that complex and has the unique yet smooth blend of different architectural styles.